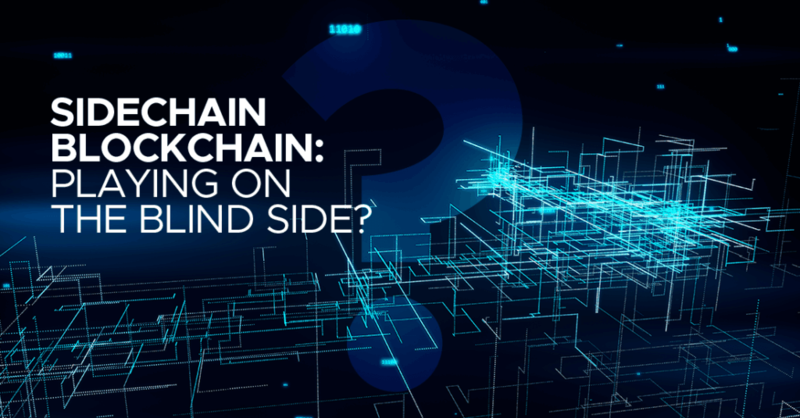 Blockchain and Smart Contracts News / Sidechain Blockchain: Playing on the Blind Side? According to American NFL terminology, the blind side is the side of the offensive line where a quarterback (QB) can expect a sudden hit, since he is unable to see the upcoming attack. That’s why the tackle – the strongest and most experienced player – is assigned to the quarterback in order to cover his back. Now, let’s imagine the game. Mr. Sidechain, a QB, calls the play. He does quite a painstaking job, while the tackle, Mr. Blockchain, is backing him. Mr. Sidechain is pretty fast and efficient on his own; however, without Mr. Blockchain, he is not safe enough, and can hardly achieve his goal. In common words, the sidechain is a separate blockchain that depends on the mainnet. It provides many advantages like high speed, flexibility, and liquidity. You can certainly use it for transactions and computations. You can even create new tokens! However, you need your ‘daddy’ chain to verify and secure your actions. You also need to make assets trustworthy and ready for the global market. Since the relationship between child and parent chains can be described as a linkage, transferring digital assets from the original BTC blockchain to the side chain (or vice versa) is allowed. Technically, this is processed in the following way: some bitcoin tokens are sent from the BTC blockchain to an output address. There, they are considered locked, and users are not able to access or spend them. At this point, it’s time for federations to act. A federation can be defined as a group of powerful servers that work as an intermediary station between the mainnet and the side chain. One of the most important purposes of the federation is to determine the time when cryptocurrency units may be locked and when they should be unlocked. An interesting fact is that sidechain creators can grant membership in the federation to any user. After the transaction is done, users on both sides have to provide confirmation, which is communicated with some delay for an additional security. Once the waiting period ends, the coins (or their equivalent amount) are released on the child chain, and become available. Initially, sidechains were referred to as BTC blockchains. Today, you can use the mainnet of Ethereum, NEO, NEM, and others, while at the same time having the opportunity to create a sidechain of this network. Token transfer (as well as interaction and interchange) isn’t the only reason to use a sidechain. It also allows you to redesign released digital assets and add new features. And yes, you will be able to develop new blockchain apps within the sidechain. Below, you will find the most interesting sidechain-based projects launched in the last couple of years. Blockstream’s Liquid was the first Bitcoin sidechain released for commercial use. It offers instant transfers of funds between BTC exchange platforms without the need to wait until transactions are confirmed by the Bitcoin blockchain. Liquid Network has its own cryptocurrency called Liquid Bitcoin (LBTC). It is pegged with BTC at 1:1. Plasma functions as a framework for smart contracts. It allows a crypto contract to be executed with significant incentivization and enforcement. Actually, thanks to PLasma, smart contracts can continue to operate in an autonomous regime using network transaction fees. At the same time, it enables blockchain to support thousands of different financial applications all over the world. As a matter of fact, this type of solution can be defined as an alternative to centralized server farms. This sidechain project with a cat’s nickname was released by Rootstock (RSK). Ginger’s network utilizes a two-way peg with the BTC blockchain, and is used to reward BTC miners through merged mining. With RSK, the BTC blockchain can be enhanced by fast payments and smart-contract capabilities. This is a blockchain-as-a-service platform for business based on the proof-of-stake consensus mechanism. Most of its transactions are processed on the child chain level since the main chain provides a minimal set of features. In this case, the most attractive feature for customers is the ability to access cryptocurrencies and other assets via child chain. Oh, yes, you’ve definitely heard about it. Ulord is well known for its multi-sidechain design. There have been two side chains developed under the platform so far, and there will be probably more. In order to meet different app scenarios, Ulord is going to attach to its main net as many child chains as possible. This sidechain increases privacy while transferring Bitcoin. For instance, if you get your BTC to the sidechain using the Zerocash protocol (in order to deliver it to an anonymous recipient), this transaction won’t be recorded in the transaction history. No one can track it, and it won’t cause any damage to Bitcoin security. Most experts predict a prosperous future not only for BTC but also for Ethereum sidechain. Taking into account the extreme popularity of cryptocurrencies, there is really no doubt. Fortunately, sidechain technology solves most of the problems existing blockchains currently have, or will have in the near future. Below, you will find some of the most disturbing issues and ways to resolve them. Block scaling and limited number of transactions are not an issue anymore. Since a cryptocurrency can be transferred from one generation chain to the next, improvements in scalability and the evolution of blockchain protocol are irreversible. In addition, they are able to store huge masses of data. There have been a lot of failed blockchain applications. Sidechain technology allows us to test new software in a real environment, or upgrade existing programs. Even if testing apps happen to be unstable or vulnerable, they won’t impact the mainnet. All damage will be kept within the child chain. Within the sidechain, you are supposed to forget about transactions that are time-consuming. Despite the federation layer and confirmation period, they will be processed faster, because using blocks within the sidechain takes less time than creating new ones on the blockchain. Huge transaction fees in the mainnet can be considerably reduced with sidechain logic. Instead of recording every move, a big set of moves can be parsed and completed out of the parent blockchain. Have you ever tried to count how many coins and ICOs exist today? Well, as far as most of the blockchain assets are backed by BTC, there will be fewer Bitcoins from month to month. Greg believes that sidechains will be able to provide some sort of inflationary ratio and help users to decide whether to work with certain tokens or not. According to Stanislav Sheliakin, who has a significant experience as a business analyst for Big Four firms and Applicature, a sidechain can be also a perfect solution for business alliances and consortiums. Unlike mainnet blockchains, which don’t follow “know your customer” processes and demand big investments, sidechain projects are able to save a lot of time and money (no extra blocks, no transaction fees). In addition, they provide ensured workflow transparency and a confidential relationship between entities. Permanence. It is one of its most attractive advantages. Why? Because you don’t have to create a new sidechain every time you start a transaction or do some task outside the mainnet. Interaction. Interaction between assets allows you to use a certain cryptocurrency from one blockchain into another. Since blockchain technology is very flexible, the hybrid system means not only on-chain and off-chain environments, but also collaborative (hybrid) development. Development. Sidechains work as an environment where you can develop new features or upgrades for blockchain applications (read more: How to Develop a Customized Blockchain Decentralized Application). You can release beta-versions of new coins or test other solutions without risk. Vulnerability. Since sidechains are commercial projects, they can attract many hackers. With a well-thought-out plan, a 51% attack (when a user or other single entity gets more than half of the hash-power and takes control of the chain, e.g., POW-based system) can go live. Even if that happens, it won’t cause any impact on the original blockchain because of its logic and structure. Miners. They are not bad guys, really. But when developers give life to a younger BTC blockchain brother or any other PoW consensus-based model, they have to hire block-builders and pay them for checking and ensuring sidechain safety. This could make transactions more expensive than they are at present. According to BitcoinWiki.org, federation is considered to be a sidechain advantage. Funny, but at the same time, it can be defined as a disadvantage. Federation itself isn’t a bad thing, as you know. It is one of the main prerequisites for sidechain functionality, and determines the condition of used coins. Basically, it works as an extra layer of control. However, any additional layer built through federation may be considered a weak point for hackers ready to attack. Sidechains can improve the capabilities of blockchain platforms significantly. They can be named as the avengers that are going to save blockchain universe from becoming obsolete. The ability to provide transactions faster, develop blockchain apps further, and exchange coins in simpler ways makes this technology one of the most popular within the cryptocurrency community.